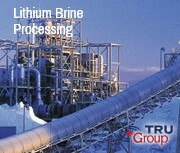 TRU Group clients in lithium and brine range from junior or high tech, to multi-billion- dollar conglomerates, for example, Advanced Metallurgical Group LSM, Materials & Electrochemical Research Corp, OM Group Inc, Mitsubishi Corporation, ExxonMobil, Resource Capital Funds USA, Sojitz Corp, Rio Tinto, POSCO, Lithium Americas, Rodinia Lithium, Chemtura-LanXess and several other junior & senior mining companies. TRU Group Inc has a full comprehensive capability to engineer the production of battery grade lithium chemicals from brines or minerals! We are world leaders in resource evaluation, salt lake salar exploitation, brine & mineral ore (spodumene, pegmatites etc) leading-edge lithium extraction, processing, purification refining and recycling technologies - those in use, prospective, and leading edge - solar evaporation, selective ion adsorption, solvent extraction, electrodialysis, nanofiltration & advanced membrane, sileach /u-max, spodumene conversion, mica etc. Importantly our team includes strong potash, boron / borates, iodine, bromine, magnesium and fertilizer capability usually lithium production coproducts. TRU Group Lithium & Brine Team is expert in all aspects and lithium technology suppliers of Lithium Chemical Engineering, production and refining of lithium resources such as evaporation ponds, brines, spodumene mining: lithium basic chemicals - lithium carbonate, lithium hydroxide, lithium chloride: lithium intermediates - organo-lithium, butyl-lithium, lithium metal, lithium alloys and compounds - lithium cobaltate (LiCoO2 - positive electrode-active material for a lithium secondary cell). We have simulated, mapped, described and analyzed process details of many producer facilities. 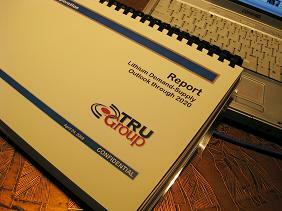 TRU Group has conducted numerous lithium Lithium Feasibility Studies and Lithium Investor Due Diligence. assignments. Importantly in the lithium and battery materials space - where there have been few successes of over 100 new project attempts -TRU Group standards are high and we are the most high-profile globally in warning of the now proven dramatic consequences of the lack of technical competence in the comparatively novel highly-specialized lithium space. TRU Group has all the expertise required. This being so TRU Group participates in lithium projects TRU Group assesses as totally legitimate and that have reasonable prospects. TRU Group Lithium & Brine Team members 2018, with over 150 person-years of experience at all the lithium Big-3 majors - SQM, FMC, Chemetall and China facilities - have managed, evaluated, designed, engineered, pilot-tested, specified equipment, developed and built these existing lithium plant facilities. Indeed the Team includes individuals who worked on the first geological & chemical lithium investigations in the 1970's for Salar de Atacama, Chile and Silver Peak, USA! Our team members know, have visited and have assessed most of the lithium facilities or salars in the lithium triangle Chile, Argentina & Bolivia, plus China Nevada USA, Australia, Canada, Russia and Zimbabwe etc. Indeed, Ihor Kunasz (pictured left at Salar Uyuni) has worked in lithium & brine for over thirty years: Kunasz conducted the original exploration and brine resource determination of the Salar de Atacama and supported the Sociedad Chilena de Litio Operations through 1994. In 2014 he received the American SME Robert M Dreyer Award for his expertise and lifetime achievements in lithium & brine. 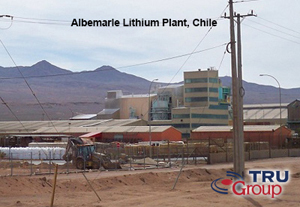 In addition TRU Group undertook the most comprehensive, salt-flat through all downstream facilities, operational and financial global analysis of the lithium Big-3: SQM, FMC and Rockwood-Chemetall (acquired 2014 by Albemarle Corporation). 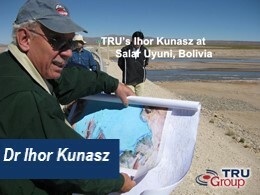 TRU Group has been engaged concurrently in several salar brine, mineral based spodumene and Sulfate of potash (SOP) / oilfield / geothermal / bromine brine feasibility / amenability lithium chemicals conversion studies. TRU Group Inc uses chemistry simulation modeling to evaluate resource potential. For example, TRU modeled brine-bittern-carbonate-process options to rank over 170 global lithium brine salt lakes / flats / salars (plus geothermal, oilfield brine sources) for their amenability to the use of emerging lithium extraction technology (electrodialysis • selective absorption • ion exchange •	POSCO • Eramet • Tenova-Bateman •	Simbol Materials-Alger - Tesla Battery driven etc).We have also evaluated and ranked major global lithium mineral ore sources comparing mineral-based to brine-based resources. TRU Group have undertaken many technical, engineering, modeling, industry, economic, financial, cost, marketing, supply-demand, feasibility and due diligence assignments in lithium. TRU Lithium & Brine Team includes lithium application specialists for example in batteries [plus battery design], fuel cells, electric vehicles, glass, lithium chemicals [such as lithium lubricants / greases and pharmaceuticals] lithium alloys and other battery material. TRU Group has diverse BRINE TECHNOLOGY capability. Our brine projects and expertise encompass salars, salt-flats, salt-lakes, evaporated lakes, geothermal-brine, produced-water brines (from oil & gas drilling / fracking), sea water, semi-processed waste brines, desalination plant waste brines, coal seam gas water, mining brines, any wastewater and groundwater aquifer brines or evaporated salt in various forms. 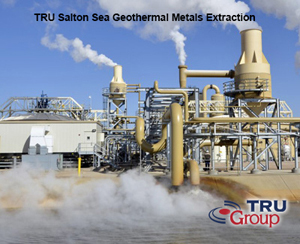 TRU Group in 2017 is continuing its assessment of the amenability of various processes for lithium & zinc extraction from Salton Sea geothermal operations, USA. We are also still working mid-2017 on a similar assignment for ExxonMobil with respect to oilfield producer brine for the extraction of Bromine • Iodine • Lithium • Potash • Magnesium • Strontium • Zinc. 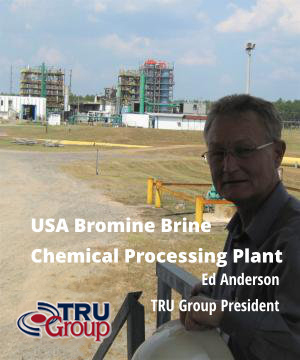 Earlier TRU Group examined the Smackover brinies in in the USA for Chemtura bromine / bromide chemicals. TRU Group has in depth state-of-the art engineering capability in extracting valuable brine-based chemicals such as lithium, magnesium, potassium, bromine, iodine, boron and others. Our TRU Group Lithium & Brine Team members have visited and have studied all of the major and most of the undeveloped brine resources - South America, China, Tibet, and USA (Smackover AR & Salton Sea CA). Examples,Salar de Atacama, Maricunga, auchari, Incahuasi, Olaroz, Puna Region, Clayton Valley NV, Smackover Arkansas bromide brines, Sabkha Matti / Dead Sea Middle East and many others around the world.